Much like the temple of Bayon, Phnom Penh is a city of many faces; but unlike the smiling stone visages said to immortalize King Jayavarman VII, the expressions of Phnom Penh are a bit more paradoxical. On one hand, Phnom Penh is a foreigner-friendly city built on resilience. Despite the thick coils of telephone wire bunched hazardously atop electrical poles, it seems a lot more developed than its almost pastoral sister Siem Reap. Its roads are paved, for one. But on the other end of the spectrum is the more harrowing face of a city whose history is pockmarked by recent, incomprehensible acts of genocide. Anthony Bourdain depicts this dichotomy perfectly in the No Reservations episode on Cambodia when he juxtaposes video footage of his first trip to Phnom Penh as a slightly disillusioned youth traipsing the streets in search of bars and nightlife, quite content with the cursory, tourist-y aspects of the city with a second and more seasoned perspective of an older and informed traveler. Upon his return, he provides a much more calculated and careful look into a grim past that is hardly fit for words. We began with the Killing Fields, which were a bit of a tuktuk ride away. The city gave way to decidedly more rural scenery and soon we were turning off the main road and down a dusty side street. As with much of Cambodia, I wasn’t sure what to expect. Regrettably, I hadn’t done much research on the Killing Fields; my knowledge was limited to what I’d read about in relation to the genocide itself, Pol Pot’s ruthless and impossible plans for transforming Cambodia into a perfect agrarian society. 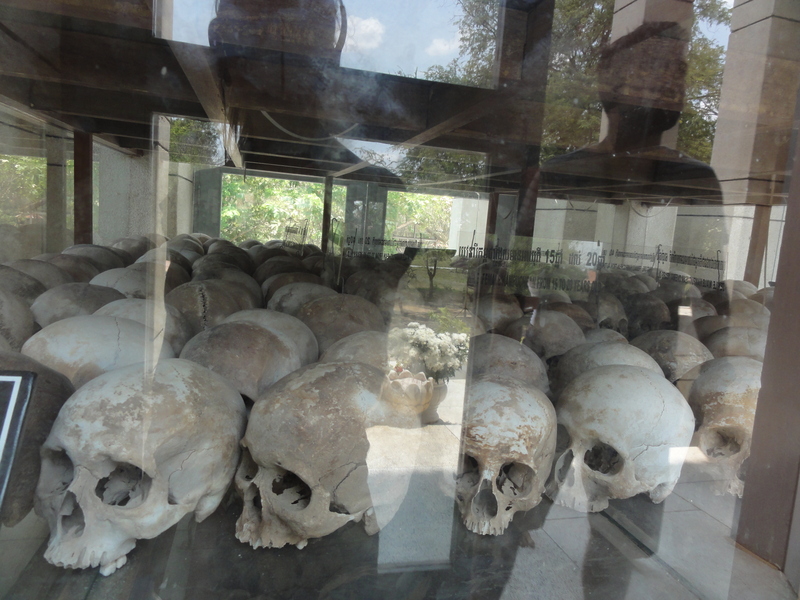 It costs a mere $5 to enter the Killing Fields, which includes a visit to the genocide museum on site. We picked up a pamphlet and the audio tour and went on our way. At first, the atmosphere doesn’t seem particularly grim. Granted, you know the scale of the atrocities committed there, but there isn’t something tangible to represent it. It’s not like visiting Auschwitz, where you’d be faced with the remnants of the camp and immediately feel chilled. But as you walk, the audio explains the structures that used to stand at each numbered site: a truck stop where prisoners were admitted into the camp; detention centers; executioners’ working offices; a chemical substances storage room. 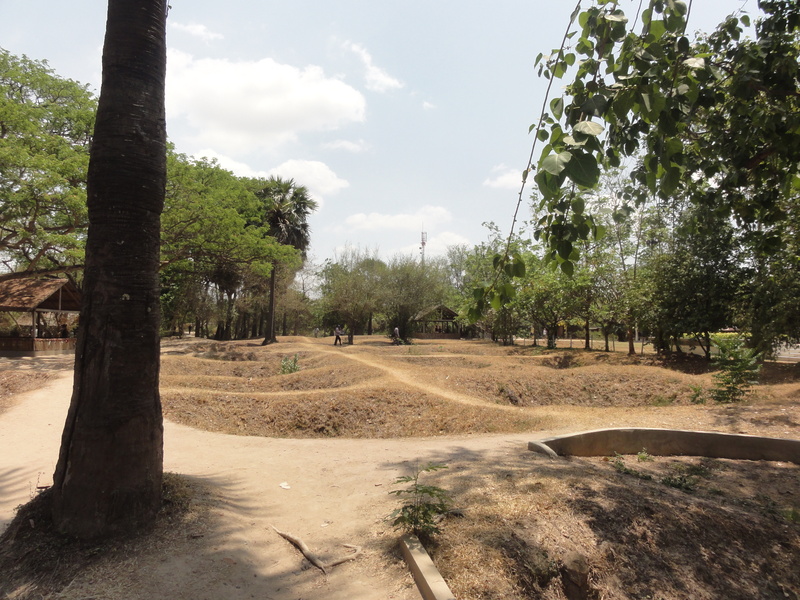 As the path winds through the camp, the level ground becomes punctured with deep trenches and pits that mark the mass graves. What’s even more unnerving – and serves as a jarring reminder of just how recent this was – is that more bones, teeth, and scraps of cloth rise to the surface each year during the rainy season. You are instructed to remain on the path, where bits of cloth are visible beneath your feet. It’s a heavy and disturbing experience. Bones and prisoners’ clothing are displayed in glass cases along the path; low enclosures surround the sites of some of the mass graves for both prisoners and guards who were deemed enemies of the Khmer Rouge. 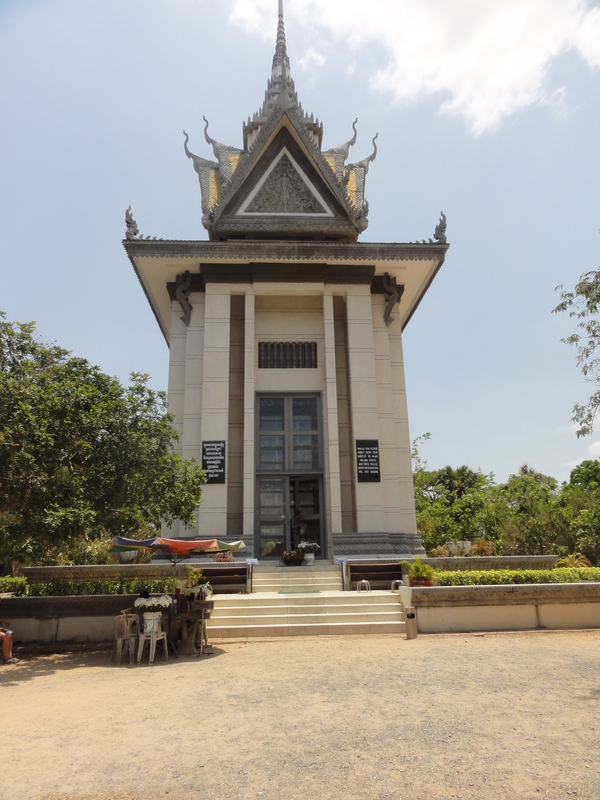 The tour ends at the memorial stupa, the 17-tiered glass pagoda that houses hundreds of bones and skulls and is most famously associated with the Killing Fields. It’s a lot to take in at once, but the most difficult part of the tour for me was at the Magic Tree, which is something of a misnomer. When victims were brought to the Killing Fields, speakers were placed in the tree to broadcast Cambodian revolutionary songs and, as the audio tour pointed out, to muffle the sounds of people dying. In addition, generators were brought in for illumination at night. At this stop on the tour, the audio plays a combination of a revolutionary song and the loud buzz of the generator to give you an idea of some of the last sounds the victims may have heard. Unnerving doesn’t even begin to describe it. I didn’t stick around that spot for very long. 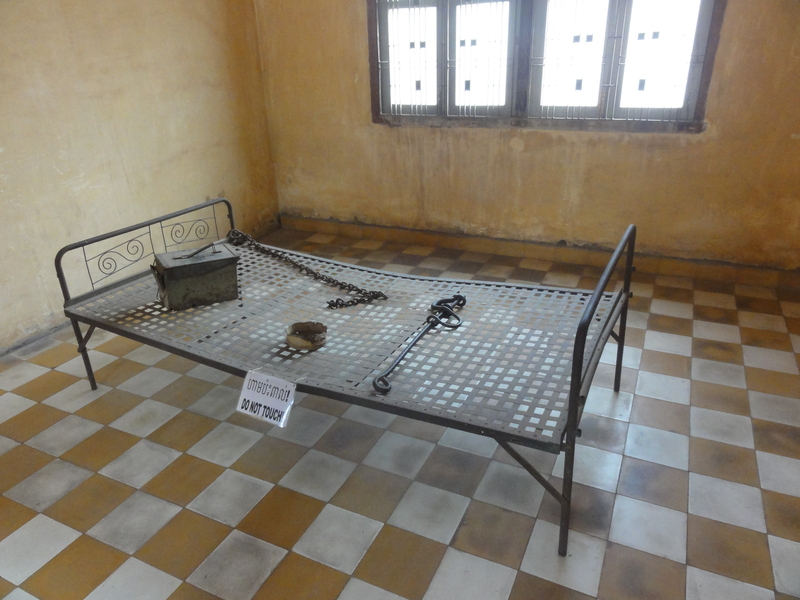 After the Killing Fields, we headed back into Phnom Penh for S-21, the high school that was notoriously converted into a prison and torture center. Located right in the middle of town, S-21 still bears all the resemblance to an old high school, which makes it even eerier. Imagine walking onto a high school campus to find a makeshift gallows in the courtyard and iron beds in the classrooms. Rooms in one section of the school hosted numerous prisoners and were used for detention. In the other sections, rooms had been cordoned off into even smaller cells using bricks and mortar. As if the site itself wasn’t chilling enough, many rooms on the ground floor are filled with photos of prisoners and pictures depicting the sorts of torture that were used there. During the time that the Khmer Rouge were in power, people were evacuated from the cities and sent out to the countryside to perform unfeasible tasks like tripling rice production in under a year, leaving central Phnom Penh much like a ghost town. Still, it’s hard to imagine being held as a prisoner in what used to be a high school with homes and shops just outside the walls. By the time Steve and I got to the tuktuk outside of S-21, I was feeling heavy with gloom and was pretty grateful to be back in the streets of Phnom Penh again. In this way, Phnom Penh is quite different from Siem Reap. Siem Reap is far more tourist-driven with a sense of adventure and serenity while Phnom Penh seems to bear the scars of the genocide more heavily. It is for this reason that it has been hard for me to write about Phnom Penh; there’s an optimism in its future and in its resilience, which is attractive to tourists. It’s easy to bar hop and enjoy the palaces and outdoor markets and greenery without noticing much in terms of its dark and recent history. But at the same time, the Khmer Rouge and its impact on Cambodian society are not to be ignored. I don’t think it’s possible to fully appreciate the future of Phnom Penh without understanding exactly where it is coming from and what it used to be. Really excellent, – I don’t think I even took photos at S21, I was too shaken. You have caught the paradoxical nature of the country and its people very well, – a gigantic mouthful to try to digest, and with so many writers attempting it, so much background information to sort through. Indeed, Cambodia is the country that affected me most in the whole world, – so many levels of history and human nature. Thanks! I appreciate it. It was a hard one to put into words, and I felt kind of weird taking pictures…almost like it wasn’t something you SHOULD photograph. Definitely agree with you on the levels of history and human nature!